Muddle 1 sugar cube and 2 dashes of Angostura bitters with cubes from one slice of grilled pineapple. Strain over an ice sphere or giant ice cube, because it was 90+ degrees outside! I love making Old Fashioned variations because they're easy to make once you get it down. 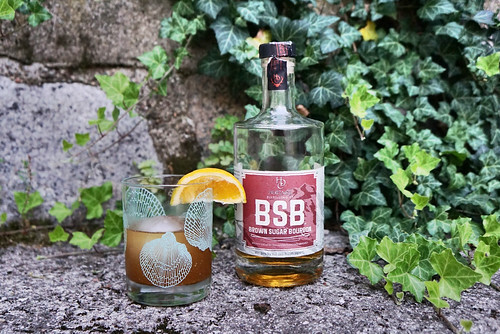 Thanks to the BSB and pineapple, this was a sweeter rendition of Old Fashioned with a smoky aroma. I had an idea stuck in my mind, though, to make a coffee cocktail with it. Mix with ice, strain over an ice sphere. 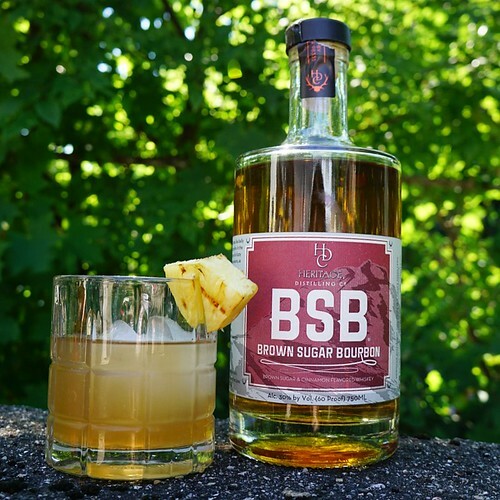 Now, for my personal taste the BSB is sweet enough that with the little bit of fresh orange juice, you don't need another sweetener. Should you want a sweeter drink, though, feel free to put in a teaspoonful of agave syrup. I gave it this name because even though I didn't know it when I made the cocktail, apparently coffee and orange juice combo is a real thing. Particularly, espresso and orange juice is apparently a big thing in Phoenix, according to this Extra Crispy article. Who knew? The BSB is retailing around $30, pretty good value! Disclosure: This post is sponsored by Heritage Distilling. All opinions are my own.